On April 10, 2008 a gathering of LDS spoke together about LDS belief, stewardship, and wild lands. It was an evening for personal reflection and thoughtful exchange around questions such as: What do Utah's wild landscapes mean to you spiritually? How do LDS beliefs and teachings call on us to care take the natural world? How might we join with people from other faith traditions to foster better stewardship of our wild land heritage? Guided by a trained facilitator, we talked and thought together in small groups and then "harvested" what was spoken and heard in order to make visible the stories, insights and learning that has been shared. This evening of dialogue was part of a larger initiative (sponsored by the Southern Utah Wilderness Alliance, and in this case also by the Utah Humanities Council) that brings people together within different communities of faith and also across faith traditions to talk about why our state's wild land heritage is important spiritually to Utah citizens. The initiative is based on the belief that Utahns from all religious traditions, as well as Utahns of no particular faith tradition, value Utah's wild lands as places of spiritual inspiration, connection, renewal and solace. It is also based on the belief that coming together to share what is important to us individually and collectively will reveal collective wisdom that can guide our stewardship of the wild lands we love. To download a more complete document on this event, please click HERE. Utah Valley gets an "F"
On May 1st, the American Lung Association released its “State of the Air: 2008” report awarding Logan, Salt Lake City and Provo with “F’s” for short-term air quality where spikes in pollution make it especially harmful for lungs and submerge us and our beautiful mountains in a fog of health-damaging smog. 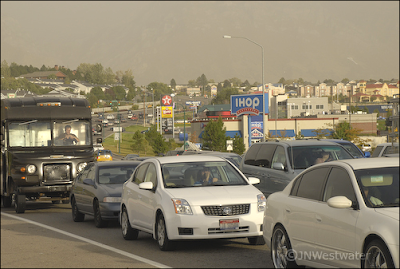 According to the report, these Utah communities (including their surrounding areas) rank among the dozen worst cities for spikes in air pollution. Logan ranks 6th, Salt Lake City 7th and Provo 12th. Who is to blame for this appalling situation? We are. Our population is growing fast and with it come urban sprawl and its harmful effects. Unfortunately we’re way too dependent on fossil-fuel vehicles that pollute. We get most of our power from dirty, harmful, coal-burning power plants. Equally disturbing, we continue to elect community, state and national leaders that are failing to adequately protect the air, our health and cannot even protect our view of the beauty around us. There are better, smarter, healthier and sustainable ways of living, transporting ourselves and obtaining our electrical power. We need to elect representatives and governmental officials who will mandate that we move away from dirty, harmful unhealthy practices and toward clean, safe sustainable practices and sources of energy, such as wind, solar and geothermal, all of which are abundant here in the West.